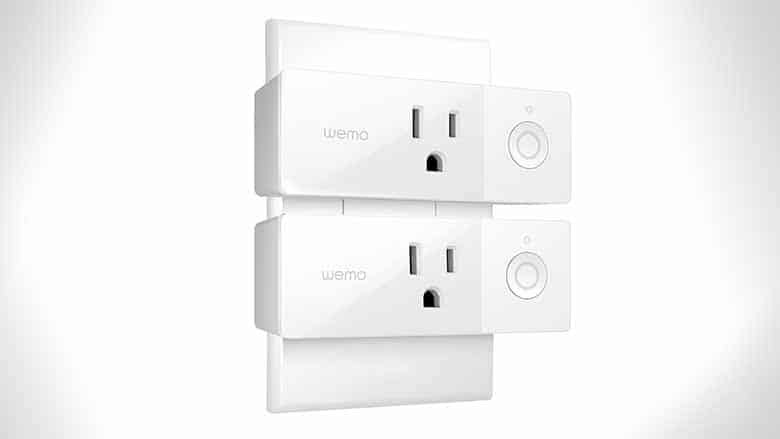 WeMo Mini Smart Plug | Nerd Much? A lower profile than other smart plugs. In our quest to make our smart home as efficient as possible, we’re always on the hunt for new Wi-Fi-enabled devices and for ways to make the devices we already have even better. We’ve got a few smart plugs floating around our home as it is right now (the best of the bunch being the iDevices Switch), but now we’ve got our sights on something a bit sexier: the WeMo Mini Smart Plug. The WeMo Mini Smart Plug slims things down quite dramatically, going for a thinner look than other devices on the market. Its compact size presents a sleek new form-factor so that you can use two Mini Smart Plugs in the same outlet. WeMo products don’t require a hub of any care, so as long as the outlet you’re plugging it into is within your home’s Wi-Fi range, you’re set. Another feature we love about this adorable little plug is the Randomize Lights feature, which will turn your lights on and off randomly when you’re away from the house to make it look like you’re home even when you actually aren’t — Kevin McCallister could’ve used this. Of course, the device also works with Amazon Alexa and Google Assistant, which means you can also use it with IFTTT for some automation. Scheduling is easy, and with it, you’ll be able to do things like turn the window air conditioner on when you leave the office every day. It’s a versatile little plug that will make your life a tad bit easier, and that’s what having a smart home is all about, isn’t it? For more of the latest cool gadgets and nerdy stuff to blow your rent money on, stay tuned to Nerdmuch.com. You can also follow us on Instagram and/or Twitter where we post the newest products as they arrive at our door. Buy the WeMo Mini Smart Plug here.